Last month the Opéra Garnier1 (Paris) played host for the return of a now rarely practiced artform, Sabrage. It sounds somewhat aggressive in title, however the reality is a process far more elegant, more reformed and now more stylish. Sabring: an elegant gesture for sensory ceremony. In homage to centuries of tradition and the celebratory nature of champagne the G.H.MUMM House of Champagne unveiled a collaboration with visionary Ross Lovegrove2; a man whose work is considered to have stimulated a profound change in the physicality of design. Ross realised this contemporary interpretation of one of the great champagne rituals in an organically shaped object that is as pugilistic as it is sword-like and as balanced as it is visually handle-biased. The champagne sabrage is one of the proud traditions of the Champagne region, and is a vibrant and genuine culture that the House has developed to be its own. “Sabrage” made its first appearance with one of G.H.MUMM’s administrators, Alexandre de Bary, in 1875. A fashionable and well-known figure in high society, he would open his renowned dinner parties by expertly sabring the champagne. He had learnt this impressive gesture while serving as an officer in Napoleon’s army. On returning from battle, as a tribute to victory and strength, officers opened champagne bottles with their sabres. Or, more precisely, they would use the spine of the blade, as their impatience led them to break off the neck of the bottle, which at the time was sealed only with string and wax or tar. 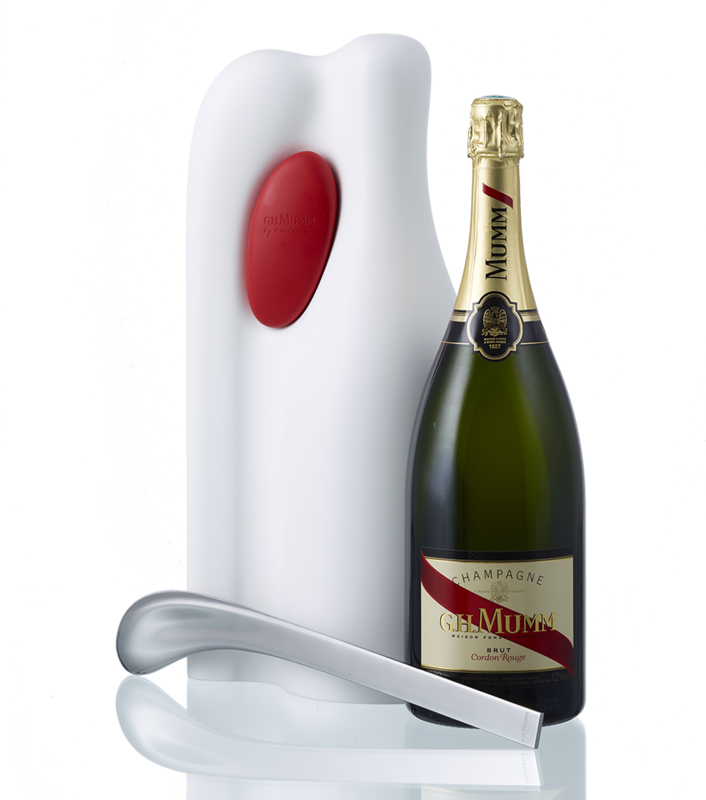 The G.H.MUMM Sabre comes in a limited edition sculptural case – the Deluxe Case by G.H.MUMM – which encloses a magnum of the legendary Cordon Rouge in an organic form creating a feast for the eyes. Personally signed by Ross Lovegrove, the Deluxe Case by G.H.MUMM will be available in selective outlets in G.H.MUMM main international distribution markets.